I didn't see Beauty and the Beast when it was released in 1991. Hell I was 15 years old and this "mushy" cartoon romance was the last place I would have wanted to be. Smash cut to 21 years later...The Reel Rhino is in the house and there is no movie I won't watch. I lost a bet last year and endured and ultimately loved the film many view as an atrocity...Justin Bieber: Never Say Never. I'll defend that film until I'm blue in the face, just as I'll defend my 15-year old self. At 15, I had no business wanting to go to this movie. In my current era, lifted of my filmic prejudices, I will see anything. As I remember it, I'm certain my 12 year-old sister loved it...in fact, I am quite certain that in my box of childhood toys, you would find several of the Beauty and the Beast McDonald's Happy Meal toys. I have enjoyed many films on the notion "I have to see it." I have an obligation to broaden my horizons as wide as possible, for the sake of this thing I like to consider psuedo-reporting. An obligation to uncover the truth about great movies. and some not-so-great as well. I do find that more often than not, I enjoy whatever it is that I go to see. I am no film snob and accusations have been made that I like too many movies. What is the harm in that, I say? At least I get the most bang for my movie buck! Disney hand drawn animation is a beautiful thing to behold. This film is no different. 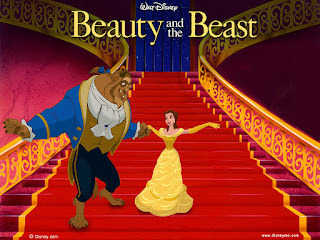 Based on the French fairytale, circa 1740, known classically La Belle et la Bete, this story is a classic one of a figurative princess, not seeking but destined to find her Prince Charming. There is a classic broad jawed villain, Gaston, that if I didn't know better was drawn in the likeness of Bruce Campbell...truly a spitting image! There is a bumbling sidekick to the villain, a sorceress, a number of moments of heroism, and some classic Disney musical numbers. 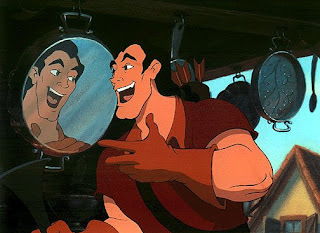 This is classic Disney animation at its finest and a film very worth revisiting, or in my case, giving a chance if you have missed it all these years. My friend Belinda shared with me this this is one of her favorite movies. She said one of the reasons was that Belle wasn't your typical damsel in distress and that after Ariel, The Little Mermaid, Belle heralded the new era of the growing strength of the female protagonist. I couldn't agree more. Belle is introduced to us on her way through her small village, headed to the bookseller to return a book that she had borrowed, and to get a new one. She dances through town reading her new book, and singing the day away. The rest of town can't understand why she isn't head over heels for Gaston, the strapping hero of the town, a nefarious chap with seemingly one thing on his mind...Belle. 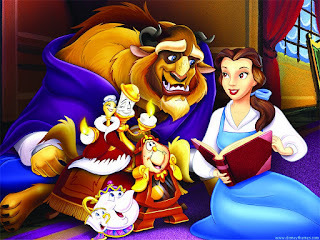 Belle wants nothing to do with his plans of domesticating her and in the opening quarter of the film, denies his proposal of marriage and embarrasses him in front of the whole village to boot. Her father, an eccentric inventor, seen as crazy by the other villagers, sets off to enter one of his inventions into a competition. He gets lost along the way and finds himself seeking refuge at the castle of the Beast. The castle is enchanted and most of the furnishings are alive and talking and singing, trying to make the most of their meek existence, living as otherwise inanimate objects subject to the rule of the Beast, a rather agitated fellow who had a spell cast on him, making him into the beast he is, when he denied shelter to a traveler as a boy, because she was so hideous. He is destined to suffer the same fate, until he can learn what love is, and also convince another to love him regardless of his looks. Belle's father is taken prisoner by Beast and Belle, in searching for her missing father, finds the Beast's castle, and offers herself in exchange for his freedom. The Beast accepts these terms. From here, it's a standard I hate you, no I love you kind of story, but presented magically the way that Disney does best. 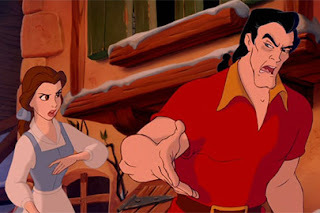 Through the movie, the path to confrontation is laid clear as Gaston, a hero to the town by their superficial standards, will not be denied his prize, simply the objectified concept that he has attached to Belle. 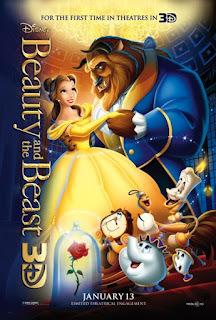 I was wholly impressed by the voice talents of Paige O'Hara as Belle and Robby Benson as Beast. This was the end of the era of using true voice talent as the 1990's saw a shift toward star power and recognition in presenting the voices of the animated features of today. The voices of Angela Lansbury and Jerry Orbach are there as well, but as fitting support of the powerful voices of the leads. David Odgen Stiers has the voice of an angel and is pitch-perfect as the narrator. 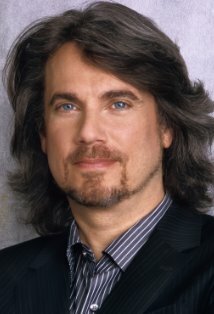 As a funny aside, I received a little criticism on Facebook for not knowing who Robby Benson is...he looks a bit like Fabio and while he has a great run of bit roles and directing gigs across a huge span of time in Hollywood, he really hasn't done anything in this era that makes him a face (or name) that I think most would instantly recognize! At the end of the day, of course you should see this film. It is a classic, it is critically lauded, and it is a really good time. If you go to see it, please tell me if I'm crazy, but there were some extremely bosomy side characters wearing fairly low cut garb...a little risque, I thought, for Disney fare. Maybe it was to give all the Dads who were roped into seeing it something to gawk at....ewwww. 4 of 5 Horns for this 3-D reissue of Beauty and the Beast. A great digital remastering and very enjoyable depth in the 3-D component of the film. I thought the crude character sketches featured in the credits running at the end were quite well done. Oh yeah, the new Disney classic Tangled gets the classic Disney short film treatment to beef up the bang for your buck. 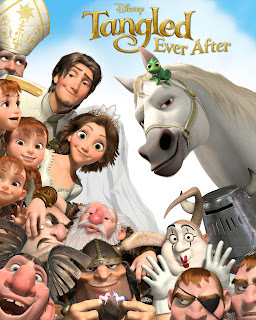 It's a cute story of the wedding day of Rapunzel and Flynn Rider, in which things don't go exactly as they are planned. With Beauty and the Beast coming in at a paltry 88 minutes, the short helps beef up the running time but made it tougher for the smaller tykes who had lost some interest by the end of the main feature.